FORMER Saltires star Gordon Goudie turned back the clock with a vintage display as Eastern Premier title favourites Grange flexed their muscles to edge out a fighting Forfarshire at Forthill. The 30 year-old seamer, who boasts a five-wicket haul against the 2009 touring Australians, earned the last of his 90 caps four years ago but a recall may not be out of the question if he maintains the form that saw him claim 5-30 to maintain Grange’s impressive start to the season. Goudie will soon be joined by marquee signing Ryan Sidebottom and the pair will surely become a new-ball partnership to be feared. Not that Goudie needed much assistance yesterday as, after his team-mates had posted 250-7, he ran through ‘Shire’s top order to have them floundering on 63-6. Forfarshire’s player-coach and Scotland batsman Craig Wallace first staved-off humiliation and then had the home men in with a slight chance of victory by stroking a superbly defiant 100no before Grange prevailed by 23 runs. Earlier, Goudie’s fellow former Scotland star Ryan Flannigan top-scored with 64 while there were useful contributions from Preston Mommsen, Nick Farrar and Dylan Budge. Shiv Gupta, on debut, was another five-wicket man as Carlton won their capital derby against Watsonians at Grange Loan. A brilliant 123no from Rory McCann helped the home side post 253-5 before Gupta’s guile sealed victory by 72 runs despite a big-hitting century from Scotland’s George Munsey. Majid Haq helped RH Corstorphine to their first-ever top-flight win with 37 runs and five wickets in a 128-run success over Glenrothes at Barnton. Elsewhere, a sparkling century from Calvin Burnett helped Arbroath recover from 30-5 to post 218-7 against Aberdeenshire at Mannofield but the home side made a successful run-chase. Champions Heriot’s were 95-run winners against Stewarts Melville at Inverleith. Ryan Brown’s half-century helped the visitors post 241-9 before Sean Weeraratna claimed three wickets as Stew-Mel responded with 119. FERGUSLIE have emerged as the Western Premier pacesetters after recovering from an alarming batting collapse to beat Uddingston at Meikleriggs. They were given another solid start by Gregor Preston-Jones and Michael English who, following last week’s century stand, contributed 80 before Ross Lyons dismissed English for 40. But it wasn’t until Lyons picked up his second wicket with the total on 122 that the Paisley batsmen collapsed in spectacular fashion. Preston-Jones departed for 46 as Ferguslie proceeded to lose eight wickets for the addition of just 18 runs. Uddingston’s hopes of a successful chase were dented when their first three batsmen fell to run-outs before Lyons rekindled hopes of victory with a purposeful knock. However, when Lyons was caught at slip off Haroon Tahir the writing was on the wall for the visitors who fell 39 runs short, the final wicket yet another run-out. 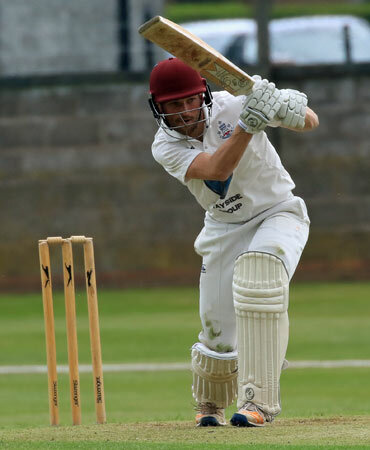 Elsewhere Greenock also struggled for runs as Ayr carved-out a comfortable win at Cambusdoon, home skipper Andi McElnea claiming four wickets for just two runs as the visitors collapsed to 84 all out. 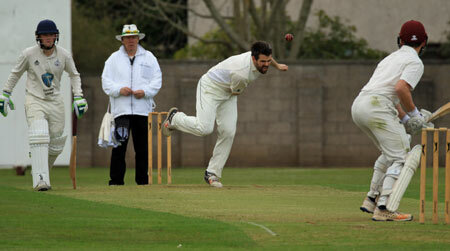 McElnea then stroked 37no as Ayr duly cruised to a nine-wicket success. West of Scotland recovered from an agonising last-over defeat to Poloc on the opening day to register an exciting three-wicket win over Dumfries at Nunholm. Traver Garwe and James Fennah each claimed three wickets as Dumfries posted 165 thanks to half-centuries from Andrew Mascall and Scott Beveridge before West’s batsmen rather nervously edged their way to the target. Poloc’s clash with Prestwick fell to the weather as did Stirling’s meeting with Clydesdale.